Learn about air bearing history and the advancements that have been made over the past two centuries from early orifice bearings to the Porous Media™ technology that New Way Air Bearings manufactures today. Robert Wills publishes a book chapter for the Cambridge Philosophical Society titled “On the Pressure Produced on a Flat Surface When Opposed to a Stream of Air Issuing from an Orifice in a Plane Surface.” The publication discusses how orifices are used to control air into a gap to carry a particular load. Many air bearing technologies still apply this fundamental principle. Albert Kingsbury, attributed with the invention of the tilting pad thrust bearings that revolutionized thrust bearing designs, experiments with a 6” diameter journal bearing supported on externally pressurized air. He was addressing a manufacturing challenge of matching bore and shaft geometry and size to achieve a consistent 0.0005” gap all the way around. Small gaps are required when using air because the viscosity is so low. George Westinghouse files a patent to employ air thrust bearings in a vertical steam turbine. In addition to offering higher performance than roller bearings, the low air viscosity and nearly zero friction operation of thrust bearings prove essential in improving the efficiency of Westinghouse steam turbines. US National Labs use air bearings in an ultra-precision machine spindle as part of its first ultra-precision diamond cutting technology used for machining laser fusion mirrors, missiles, and spacecraft with larger spherical aspheric parts. In 1960, National Lab leads the genesis of porous media technology. The granddaddy of hard drives uses air bearing spindles to produce large hard discs. With error motions in the 2 millionths of an inch and 100 times more accurate than traditional spindles, air bearing spindles allowed for higher data concentrations. The hard disc drive industry still relies almost exclusively on air bearing spindles for its spin stands. The CheckMate Coordinate Measuring Machine (CMM) first utilizes air bearing technology with a finely polished granite guide surface. Russ Shelton, CMM father, discovers the advantages of building coordinate measuring machines with porous carbon air bearings that offer straighter, frictionless motion. The silent and smooth operation is very apparent in the resolution of measurement and scanning on fly-type machines. Most modern CMMs employ air bearings for greater their exceptional accuracy and resolution. The predecessor to New Way Air Bearings™, Aeolus Air Bearings introduces the first standardized air bearing products. CMMs mostly utilize these commercially-available air bearings because of their stiffness and stability. In 1984, Aeolus offers a standard product line consisting of several sizes of affordable, simple-to-employ air bearings. L.S. Starrett Company redesigns its coordinate measuring machines with New Way Air Bearings incorporating Porous Media Technology™ instead of developing an in-house line. The name Aeolus Air Bearings changes to New Way that better describes the company’s unique air bearing products and advanced technologies. TA Instruments selects New Way air for their next-generation dynamic material analyzer. Porous Media air bearings allow TA Instruments to dominate the DMA market – a position the company holds today. New Way receives approval for a patent on its Vacuum Replication Process. 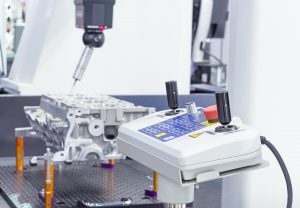 The company continues to apply this technically- and economically-effective method of fitting air bearings into precision assemblies in its slide manufacturing operations. New Way begins developing air conveying technology for non-contact handling, processing, inspection and transport of Flat Panel Display and Photovoltaic glass. New Way Air Bearings moves operations into the 35,000 sq. ft. American Sun facility, creating a new, precision-friendly, environmentally-controlled manufacturing environment. New Way launches conveyor air bearings and precision chucks are for the flat panel display OEM market. New Way makes the Inc. 5000 list of America’s fastest-growing private companies for three consecutive years. In 2008, New Way achieves ISO 9001:2000 certification. New Way introduces a line of porous media Radial Air Bearings engineered to deliver frictionless rotary motion for precision applications. The same year, the company launches an Academic Program that provides university engineering and science educators with the tools and training to learn about frictionless motion. FlexTech Alliance awards New Way a contract for developing a non-contact vacuum seal allowing for small but potentially wide vacuum chambers appropriate for chemical vapor deposition, physical vapor deposition, or other processes requiring deep vacuum. New Way issues a patent for a non-contacting Porous Media air bearing and glass flattening device. New Way expands its product line with pressurized gas bearings offered under the name of Bently bearings.